Size:15 to 105 degree C Range with Organic Fill and White Back Glass For use in all standard heating blocks and water baths. Contains red organic liquid against white back glass, except for B60810-1300 which has yellow back glass. 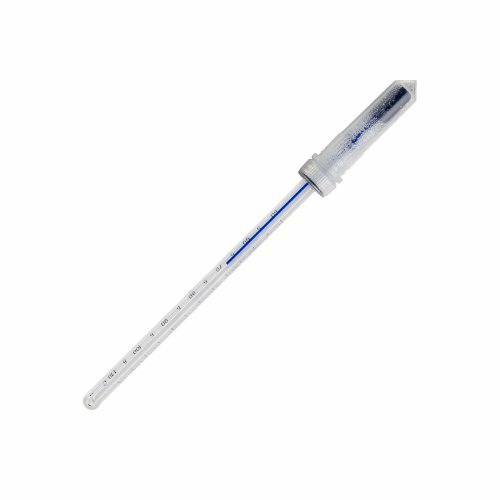 This DURAC dry block thermometer is individually serialized and designed for use in all standard heating blocks and water baths. PTFE safety coated. Individually packaged in recyclable packaging. Range: 15 to 105°C. Divisions: 1. Accuracy: 1°C. Length: 150mm (5.9in). Immersion: Total. Thermometer Fill Type: Organic. Back Glass: White. PTFE safety coated: Yes. Items B60810-1500, B60810-1900, B60810-2200, B60810-2300 and B60810-2500 feature PFA flouropolymer safety coating to keep liquid and glass encapsulated in the event of breakage. SP Scienceware a division of SP Industries is home to Bel-Art and H-B Instrument brand products. Each brand has a proud heritage in the laboratory supply market and manufactures state-of-the-art laboratory equipment and biological drug manufacturing solutions that include market leading brands Genevac, Virtis, Hull, FTS systems and National-Hotpack. As part of a larger organization committed to science we look forward to increased opportunities to serve our customers and remain committed to developing, manufacturing and delivering innovative products, right in value. We appreciate your business and thank you for the opportunity you have given us.